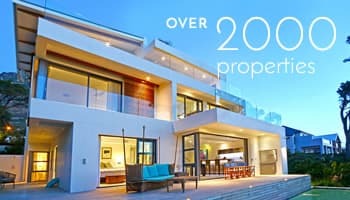 This 5 bedroomed contemporary villa mansion, fit for A-list celebrities, lies on the slopes of Camps Bay and is waiting for the jet-set to enjoy its modern, ultra chic design and sophisticated atmosphere. Classically elegant and making use of sacred minimalistic geometric architecture, it’s the perfect hideaway for groups to enjoy carefree coastal living with unsurpassed sea views and suburban grandeur. There are three levels to The Oracle, each connected via a free-floating staircase and lift. You’ll arrive at the villa on the first floor, which is the entertainment and pool area. Offset from this level, hiding away in the corner down a set of stairs is a small garden suite – perfect for those wanting to break away from the group. Adjacent to the cottage is a garage with space for 5 cars. The second level houses 4 luxury bedrooms and a Jacuzzi; and the top level is reserved exclusively for penthouse living. An alarm protects the mansion, ensuring guests feel safe and secure in the style in which they’re accustomed. There are all the mod-cons you can imagine, from air-conditioning to heating and even a designer linear open fireplace. Let us walk you through this powerful hallmark of a villa. Upon entering you will notice the sparkling blue pool and views of Camp Bay. To the right is a swanky cocktail bar area, complete with trendy low-hanging light fittings and floating work space. Adjoined to this is a lounge with a flat screen TV and L-shaped couches. The entertainment area leads out onto the wooden balcony and pool. There’s even an outdoor dining table – a perfect spot for canapés and sundowners. The kitchen is next to the lounge and boasts all the amenities that a Michelin 5 star chef would need to create their masterpiece. Here you will find plenty of cupboard space and a floating work island with a built in wine rack. Around the corner is a light and airy corridor which winds its way into a small mezzanine level with a sophisticated lounge – a sort of “VIP” area. Down the stairs, and close to the garage, is a private garden cottage with a huge bathroom complete with bath and shower. The cottage even has a small patio with views of the Atlantic. This is perfect for guests who need a comfortable, private area. When you’re done with the entertainment area, head your way up the stairs (or take the lift) onto the second floor, which is home to 4 bedrooms. The master bedroom is called the “Atlantic” and is a mini-villa on its own. A king size bed faces out onto sweeping views of the coastline and the entire room is framed with glass, ensuring you wake-up to the best views of Cape Town. There is a walk-in shower, a day bed/sitting area, Jacuzzi, balcony and deep, rounded bath overlooking Camps Bay. The other 3 other luxury bedrooms are equally luxurious but vary in size and stature. The largest being the “Lions Head” which has its own patio with chairs. The third level is penthouse Nirvana with furnishings fit for a king. Befittingly, there is enough space to literally wallow in royal luxury. A huge balcony with a massive Jacuzzi, outdoor furniture and sunbed awaits. There are wrap around sea views and the penthouse could be a condo on its own. A separate lounge with a TV joins the master bedroom which has a flow through, open-plan bathroom with a deep rounded bath and walk-in shower. The décor is the same throughout the villa, with public spaces boasting palettes of crisp creams, sandstone and grey colours. In keeping with minimalist design themes, there’s a strong focus on the monochromatic. Influences of colour can be found in the Art Nouveau style paintings scattered throughout. There’s a slight Venetian influence – notice the mirror motif at the entrance and the use of large patterned mirrors in each of the rooms. 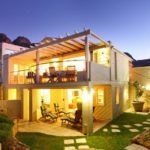 This is not a place for children but certainly is a place where you can walk in the footsteps of celeb style living in Cape Town’s wealthiest area. Fine dining restaurants and the pristine white sands of Camps Bay beach are accessible via vehicle. Ready to stay at PICASSO?